Why hire a property cleanout service? Well, on-balance, it’s usually a good move because it takes the onus off of you. Let’s say you need help with a foreclosure cleanout or a hoarding situation. Whatever the circumstance, it takes the burden off your shoulders and gives you the freedom to focus on other things. So, why not rent a dumpster, instead? The answer just might surprise you. Many people first think about just renting a dumpster. It seems to easily be the perfect answer. You schedule a day and time, the container is dropped off, and you simply throw stuff into it. Voilà! It’s done and you don’t even have to deal with hauling it away or taking and sorting it in a recycling facility. But, that’s usually not the case. If you do rent a dumpster, it’s got to be the right size. If you rent one that’s too small, you’ll have to pay for it again. And, if you rent a container that’s too large, you’ve wasted money in wasted space. Plus, you still have to do all the work. What’s more, dumpster rental companies place all sorts of restrictions on what’s acceptable. It’s more convenient. Make no mistake about it, the DIY route is a difficult one. Put simply, it’s not that simple and will take more time and effort than you believe. Avoid some big safety risks. 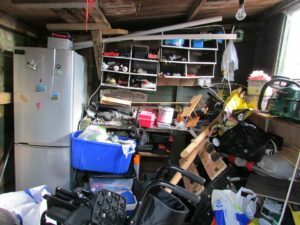 Too often, junk disposal means far more than having to deal with dirt and grime. It also usually includes health and safety hazards. For instance, if you are cleaning out a foreclosure or a fixer-upper, there are probably hidden dangers lurking about. All the junk hauling is done for you. There’s little question about the complexities of hauling junk. You need the time and equipment. So, it’s better to bring in a team that’s got it covered from start to finish. The service brings the right resources. Of course, there’s always the matter of having the right tools on hand and a set of helping hands, as well. When you hire a property cleanout service, they come well-equipped and ready to work.